After migrating Pandify’s URL scheme to HTTPS, I noticed that the site’s Facebook likes had disappeared! This post describes how I fixed that. However, the like button’s count reflects the likes for the current page’s URL, and NOT for the URL you configured the like button with. If a page’s URL changes at all, including the URL scheme, that page’s like button count will change to reflect the new URL’s like count. …you can’t move the likes, shares or comments directly to the new URL but you can use the old URL as the canonical source for the number of likes or shares at the new URL. Option #1 is a no-go because Pandify’s Nginx server redirects HTTP to HTTPS. Again, this is what causes the Facebook likes to disappear. I want the canonical URL to be the HTTPS URL. Left with option #2, I added a <meta> tag to Pandify’s HTML template that points to the non-HTTPS URL (which has the Facebook likes associated with it). Circular Redirect: We could not resolve the canonical URL because the redirect path contained a cycle. What’s happening? Facebook’s scraper is following the <meta> tag’s og:url (the non-HTTPS URL) and getting redirected by Nginx to the HTTPS URL, causing a redirect loop! # Preserve Facebook likes from the non-HTTPS URL. # NOTE: Add other Open Graph tags to keep Facebook's Sharing Debugger happy. Voila! 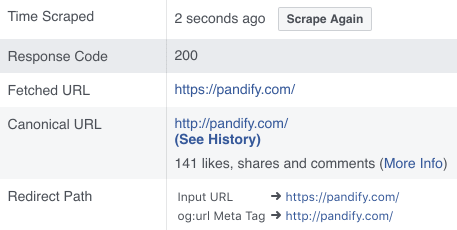 After restarting Nginx and forcing Facebook’s Sharing Debugger to ‘Scrape Again’ for https://pandify.com, the likes from http://pandify.com returned. 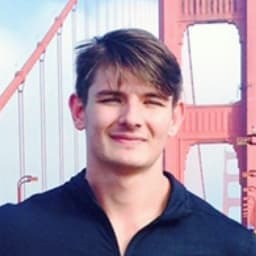 If you have suggestions for improving this post, shoot me an email!